Written by th. Posted on May 22, 2009. Filed under Carbon Fiber. 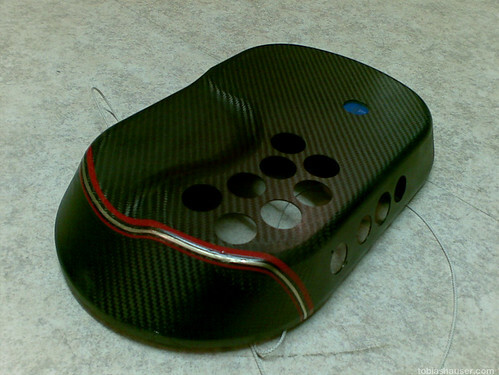 Tagged carbon, composite, fiberglass, frp, gaming, joystick, product. Bookmark the Permalink. Post a Comment. Leave a Trackback URL. Decided to paint the interior glossy black. The exterior received a first layer of clear coat. On top of it the case received 3 pin stripes in red and gold. When discussing the colors we decided for black, red and gold as their our national colors – made in germany. 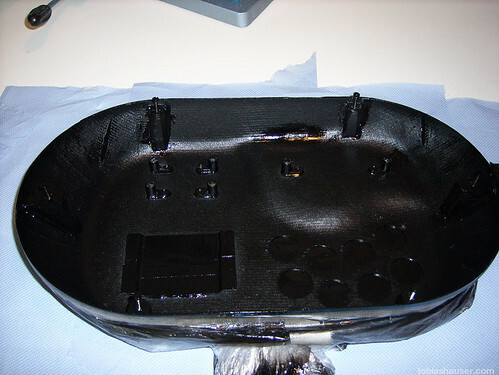 Pretty international project: Stick + buttons from japan, 360 PCB ordered in the UK, Chtulhu made in the USA.